Snow in September? 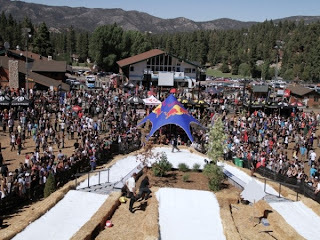 Definitely, at the highly anticipated 10th Annual Hot Dawgz and Hand Rails! Impressive lineups of over 40 professional snowboarders from across the world are slated to take part in the annual winter kick-off event at Bear Mountain. 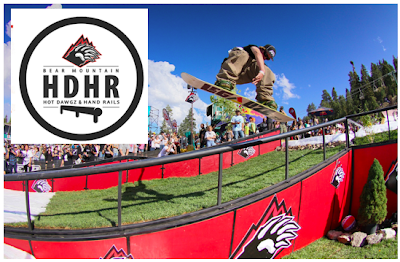 The best of the best high-performance athletes will take over the mountain on Saturday, September 21 to showcase their ultimate skills and compete for bragging rights- and $15,000 worth of cash prizes- at the one and only Hot Dawgz and Hand Rails snowboarding competition. The men’s first place winner will be awarded $10,000 and the women’s first place will take home $1,000. The jibber with the best trick will take home $500. Both men and women’s first place finishers and the best trick winner will be presented with one-of-a-kind, customized iPad Minis, which will serve as their digital trophy. Provided courtesy of Fusion of Ideas, the iPad Minis will display the digital checks and headshots of winners. These winners will also take home go-pro cameras customized by Fusion of Ideas. Presented by Bear Mountain and Red Bull, the event will take place on 140 tons of man-made snow and will include urban-style steel features, which will be available for the public to ride in the Red Bull Plaza at Bear Mountain this winter season. The event will showcase the talents of Bear Mountain Professional Team Riders Dylan Alito, Zak Hale, Brandon Hobush, Desiree Melancon and Scotty Vine, among dozens of other top riders. Judges include Chris Bradshaw, Joe Sexton, Scott Stevens, JP Walker and special guest snowboard legend Dave Downing. Hot Dawgz and Hand Rails is free to the public and offers something for all ages. Gates open at 9:00 a.m. for the public to enjoy live DJ’s, dozens of vendors with exciting giveaways, a great view of the competition and of course, lots of hot dogs! There will even be a special hot dog deal, which includes a hot dog, chips and a domestic beer for just $10. 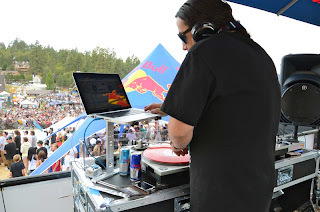 Red Bull will also present Five Knives, performing live on the Red Bull Tour Bus. Recently named an MTV2 Artist to Watch, Five Knives toured with the Smashing Pumpkins in 2012 and is a featured artist on the 2013 Vans Warped Tour. The competition will begin at 2 p.m. and is easily viewed from Bear Mountain’s 13,000 square foot deck and renowned Beach Bar, located just a few steps away from the action. For more information, please visit www.bigbearmountainresorts.com.